There’s a lot of impressive facts about the power of the human brain. And while we might be the "rulers" of the world, animals have an incredible sense of intuition and intelligence too. In fact, animal brains are just as interesting as the human brain, if not more. Animal brains come in all shapes and sizes - and in all parts of an animal's body. There are plenty of crazy animal brain facts that are almost hard to believe. These fascinating animal neurological facts cover not only what their brains look like but what they have the power to do. From the crazy and bizarre to the utterly fascinating, these amazing facts about animal brains will have you questioning just how special your own noodle really is. If you’ve ever been unsettled while walking through a park because you caught the piercing black eye of an idling corvid - the bird family to which crows, ravens, and their ilk belong - you were right to be wary. A study done in 2004 indicated that corvids may have the reasoning power of some nonhuman primates. How smart are corvids? They may very well be among the most intelligent animals on earth. The study found these birds figured out how to rid themselves of parasites by using ant formic acid, learned how to use passing cars as a means to crack nuts, and they are extremely self-aware. The internal structure of the average leech is divided into 32 equal segments. Each of those segments has its own brain. Technically each segment has one ganglia - a structure containing a number of nerve cells - that belongs to one 32-segment structure, but the distinction is moot in practice. The thing has 32 brains. The first four sections of the brain are dubbed the "anterior brain" and contains the leech's signature sucker. The brain isn’t the only thing that leeches double-up on. They’ve also got a matching set of reproductive organs and nine pairs of testes. Another fun fact: leeches are considered hermaphrodites. There are several members of the spider species that house their brains in their heads. However, as spiders tend to decrease in size, their brain size actually increases proportionately to the point that the tiniest members of the species have the evolutionary problem of trying to cram an oversized brain into a space that’s simply too small. As a result, the brains of some minute spiders spill over into their body cavities and legs. 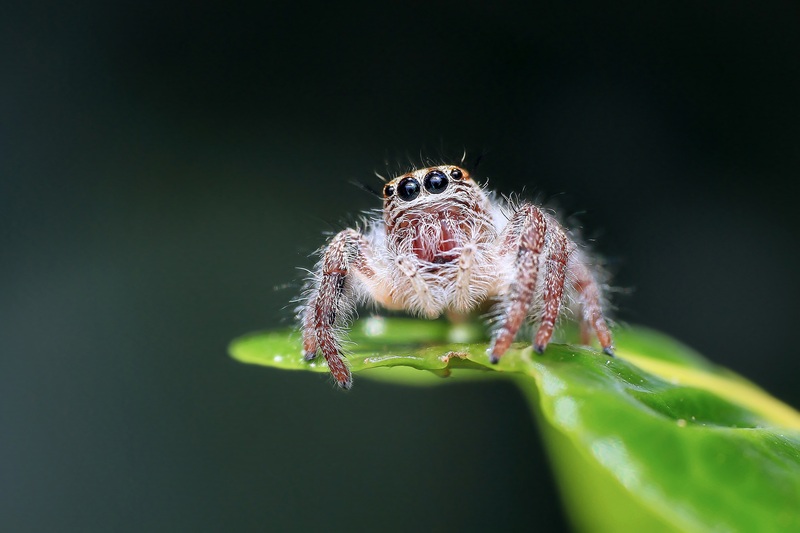 Some of the smallest spiders will actually develop bulges on their body where their brain is spilling over. Because brains use a lot of energy - and because spiders are typically so small - a lot of the food spiders eat go directly to powering their brains. In spite of the fact that a giant squid can reach up to 1,500 pounds, their brains only clock in at about .2 pounds. Even stranger, those brains are wrapped around the giant squid’s esophagus. The hole the squid’s esophagus runs through is only about .4 inches. Because of this, the animal is forced to shred its food into tiny bits to avoid giving itself brain damage. Fortunately, the giant squid is doing okay for two big reasons. First, it doesn’t eat a lot. And second, it simply floats around until food wanders into its eye line, at which point it reaches out one of its giant sucker-covered tentacles and snatches its dinner. In other words, it makes sense the brain and esophagus have a kind of symbiotic relationship within the giant squid, because what little thinking it does is related directly to its consumption of food. The giant squid hardly has a complex approach to hunting. #18 on What Sea Creature Do You Want to Be?